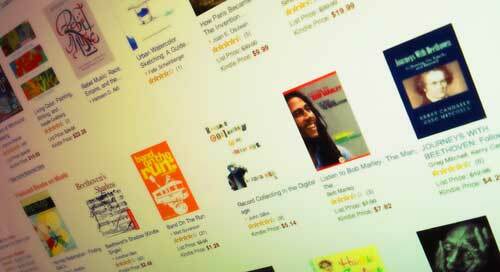 Amazon’s Kindle store has revolutionized book publishing. Everyone’s reading on Kindles, tablets and phones and, as a result, 70,000 titles are being published every month – all competing for eyeballs in Amazon’s crowded marketplace. How do you make your book stand out? The book needs to be well positioned within the market and resonate with an audience. 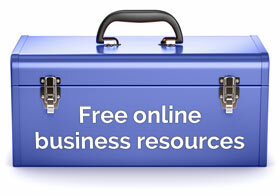 There are also important choices to be made with regards to category placing, keywords, title, subtitle and blurb. However, it doesn’t end there. What did mumma say? “Never judge a book by its cover”. Well, maybe, but people always do! Don’t try to be too darn clever! Amazon’s website shows thumbnail images of covers at a very small size. You need to communicate your book’s message to the target market within a very small number of pixels. Most importantly, it needs to stand out. Make sure you can at least read the title from a distance even if it’s one inch in size. So, out go messy, badly composed images, small text, hard-to-read serifs and a lack of contrast in the colors (above left). In comes bold simple imagery, large easy-to-read sans-serif type and nicely-composed layout (above right). 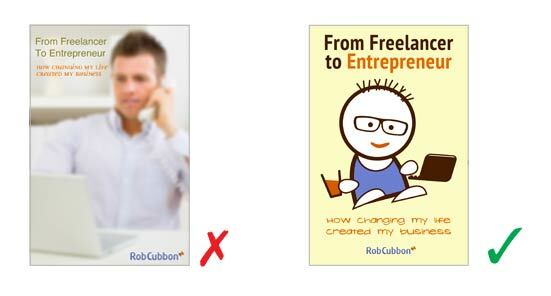 The image on the right is of my new book From Freelancer to Entrepreneur. The image should reflect the subject matter and the audience. Serious non-fiction should be accompanied by a serious image. 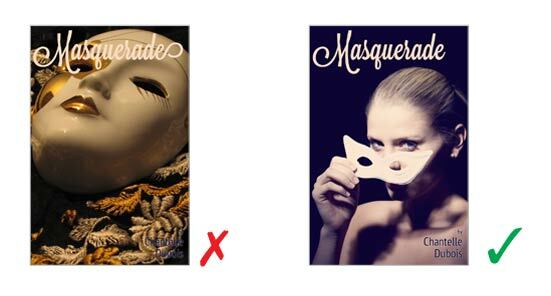 Also, try to choose images which have large amounts of “negative space” – expanses of a similar color within the image. You’ll need negative space in order to add the title and the author text. Above you can see how difficult it is to add the title and author text to your book cover if the photo is messy and complicated. On the right you see a nice simple image with loads of negative space. Don’t discount having a “textured” photographic background or no photo at all. It’s exactly the same with the font choice. It should reflect the subject matter of the book. You also have to think about legibility. Big blocky sans-serifs like Univers Bold Condensed, Impact, Helvetica Neue Condensed, etc., can work well. As well, above left there is another crime against typography as the line height in the title is way too loose, see below. If Kindlers are doing it themselves, they often make rookie errors with type. You must tighten up your type on your book covers, people! Above left you can see several crimes against typography: failure to use different typefaces – or at least different font weights and sizes – for the title and author text, loose line height and loose tracking, are the main offences. Tighten up type in two ways: line height and tracking. Line height/leading/feed is the distance between the lines of text – don’t leave this as “auto” because that will usually leave too much space between the lines of text in your title. Tracking/kerning is the distance between the letters. Tracking is the distance generally between letters across lines of text and Kerning is the distance between two individual letters (two letters that usually need a lot of tightening up are uppercase A and V). Don’t be afraid to do without an image altogether. But, of course, you have to be really clever with the typography if you do. Get the size right or, more accurately, the proportions right. It doesn’t matter how you are creating the document, just make sure it’s 1200 by 1800 pixels, 15.42 x 22.86 cm or 6×9 inches – or proportions thereof. 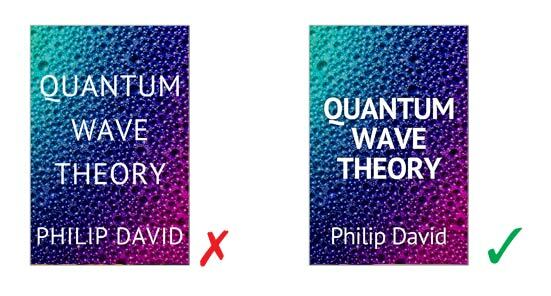 Make it a flat cover – don’t bother making a 3D cover image. Resolution? As much as you want. 200 ppi or 300 ppi. You can make it as large as you want and Amazon will recreate the image at different sizes to suit their purposes. 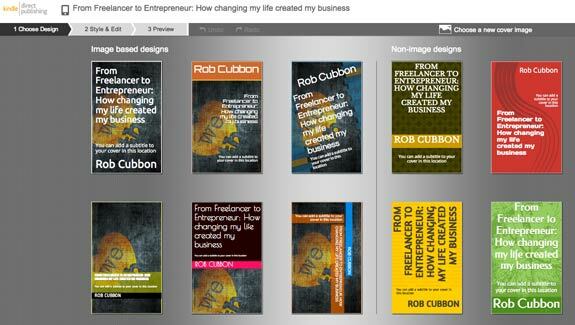 I create my Kindle covers in Photoshop 1200 by 1800 pixels in size, at 300 ppi resolution, in RGB, saved as a JPG or PNG. 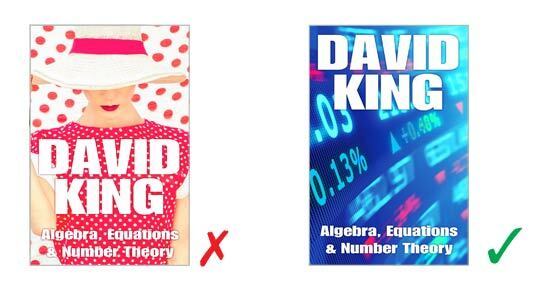 This will ensure you can use the same image for Kindle as well as the print edition in CreateSpace (you should create a print edition, but that’s another blog post). I would naturally use Adobe Photoshop or Illustrator to create my book cover design. You could struggle on with GIMP. There are also several online editors, for example, pixlr. Get your fonts by googling “great free heading fonts” or something like that. Get your images from reputable stock agencies like Shutterstock. Once you’ve created your masterpiece you upload it at KDP along with your book file and all the accompanying meta data. 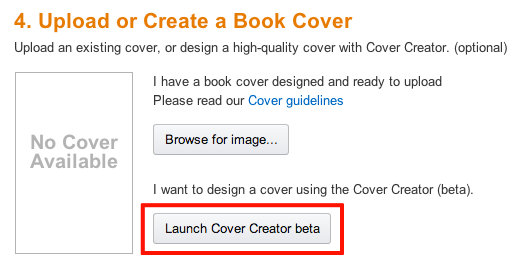 As you can see above, you can create your own online at KDP by clicking the “Launch Cover Creator beta”. Below are some I did there whilst uploading my new book. I’ve explained the whole process in the video below. 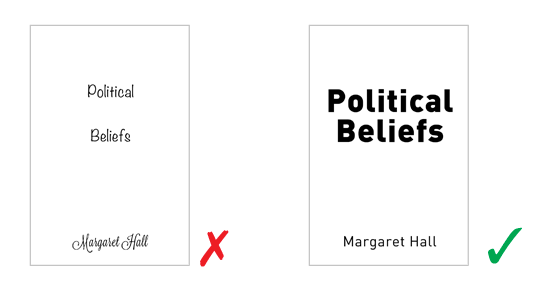 You can create a cover for your non-fiction Kindle book that resonates with your audience, communicates the book’s subject and stands out in the Amazon marketplace. This is great tutorial video, Rob. And a great post. 🙂 You know I haven’t even got my hands on completing my ebook. Dang. This is taking forever. And that’s because I’m always interrupted and just doesn’t have enough time. But someday…I put this post on my Pocket and I’m going to read this again and will be in my “reference”. Thank you very much for writing this post and tutorial video. You can do it, Angela! You only have to write 10,000 words in a Word document, Angela. You can do it! The video tutorial shows you the Amazon publishing process but there’s a lot more marketing to it, as I’m sure you’d imagine. 10,000 words…that’s like 1,000 words a post. Okay, I will give myself 10-days to write a book. Thanks for the great tips!! Yes, Angela, first write down a plan for your book. Then do the research. Then write. You can get it done really quickly that way. Seems like you have been diving into the kindle store a bit lately. Had any success? I thought perhaps it was becoming a bit of a crowded market? As it seems to be becoming very popular. Interested to know how you are going. Hi Ashley, yes I’ve come down with the Kindle-bug – quite a few people have it these days. Marketing is a big thing on Kindle and it really pays to have an audience. I email my list when I have Kindles out so a certain amount of people will buy it and review it (favorably, hopefully). This really helps. You should do it, Ashley, it could really help your brand. do you sell 2 or 3 of each a day or is that shared over all your books you have published rob ? Only i am thinking over creating at least 5 versions breaking down my digital content.